Download our brochures here to find out more about our products, services and solutions. Our Digital Mail Room solution is a modular solution allowing for the maximum automation of incoming mail with the minimum amount of human intervention. Our FlowMatrix Invoice Processing solution is one of the most cost-effective and yet comprehensive applications available in the market today. The FlowMatrix Mobile Apps facilitate field based document scanning, photo scanning and electronic document acquisition supported by easy-to-use intuitive applications. 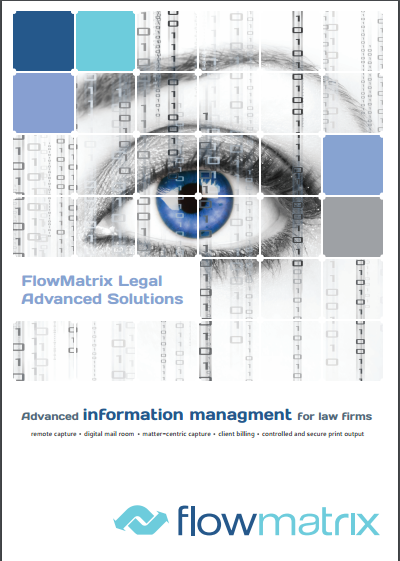 Paper River provides a range of specialist solutions for the legal market which are optimised for processing large volumes of documents in a matter-centric context. Paper River's scanning solution for planning departments takes all the hard work out of scanning documents and plans into your planning case management solution. The FlowMatrix Contact Centre solution provides a very fast way of receiving documents and supporting information from service users. Paper River develops a wide range of connectors for the Nuance eCopy ShareScan platform.